Youth is the best cosmetics that you will not get for any money. But even a young beautiful skin can be advantageously emphasized with the help of the correct make-up. What makeup is best for young skin? 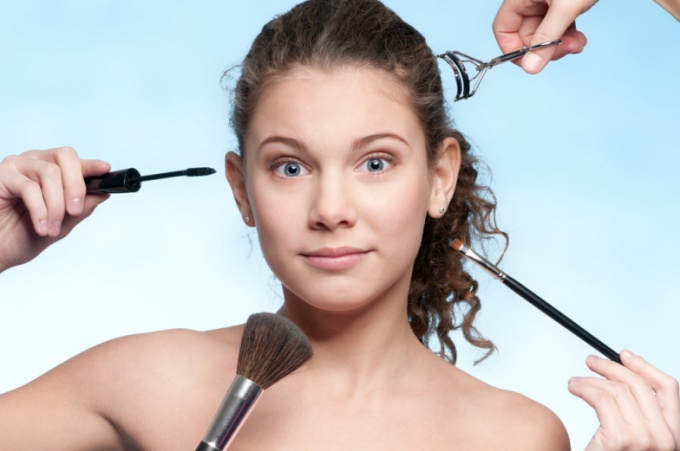 If the skin is normal or dry, it is better to take powder or a toning cream. Do not apply too much tonal funds, especially if it's daytime make-up. Otherwise, you can get the effect of mask and unnatural. If there are problems with the skin, it is better to use a corrective agent, which is applied as the basis of make-up on problem areas. But do not try to disguise every pimple with a huge amount of powder or cream, otherwise you will emphasize it even more. The corrector should be on a lighter skin tone. If you have oily skin, it is better to use a special matting base. You can also use blush, especially suitable bronze shade. Very popular is the light flickering powder, which can be applied over the eyebrows and on the cheekbones. If the skin is pale, a cold pink blush is suitable, for a warm-colored skin it is better to use peach blush. As for lipstick, then there is complete freedom. However, it is worthwhile to know several rules, as each component of the make-up should be in harmony with each other. For example, if you applied warm brown shades, then coral or peach lipstick is suitable. If the shadows are gray or blue, then choose the pink color of the lipstick. Do not overload your face with makeup, especially during the day, as it looks vulgar and out of place on a young, fresh skin. These are simple enough secrets that will allow using makeup to hide flaws and emphasize the dignity of young skin.